You are here: Home » Happy Father’s Day! It’s Father’s Day again, and ChefUniforms.com would like to wish all of the fathers out there a happy and healthy holiday with your families. If you’re like me, you are probably still looking for that last-minute Father’s Day gift. Luckily, last year we posted a blog with some ideas for just such an occasion, so read and enjoy: A Gift for Father’s Day. And as we said last year, the way to any man’s heart is through his stomach, so cook up a little something he’ll enjoy, and it’ll be a Father’s Day to remember. Here are a few ideas (in addition to those listed in last year’s blog) that your dad is sure to love, because they all incorporate bacon into the mix! Wrap anything in bacon and he will love you for it… Seriously, anything. – Bacon Strip Pancakes – speaking of breakfast, why take time preparing the main entrée and sides, when you can include it all in one! Cook the bacon strips directly into the pancakes. Save time, dishwasher space, and make your dad or husband the happiest man on earth for one glorious breakfast. – Bacon-wrapped tater tots – how amazing does that sound?! These are a great appetizer or snack, and prepare his taste buds for the bacon-tastic meal that is to come. 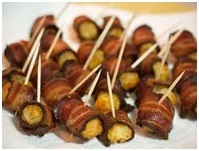 – Bacon-wrapped jalapeno poppers – give your bacon some extra kick with a spicy jalapeno inside! This is another great appetizer or hors d’ oeuvre idea, and it’ll only take you 20 minutes to prepare and make! 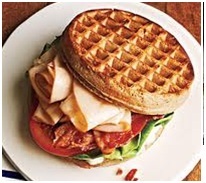 – Chicken and waffle sandwich – don’t forget the bacon! Not only will this sandwich include 3 of his favorite foods on one epic plate, it’ll be the perfect combination of breakfast, lunch and dinner that will make his mouth water just looking at it. – Grilled Cheese with Bacon – the classic sandwich with a dash of awesome. The crispy bacon adds texture and flavor to the sandwich, while preserving that gooey cheesy center. 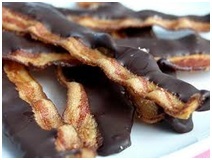 – Chocolate Covered Bacon – a dessert that includes both chocolate and bacon? Doesn’t get much better than that! Drizzle it on or dip the whole thing, it’s up to you! Of course there are thousands of bacon-themed ideas to choose from, but this was a short list of the ones that I plan on trying myself in the near future. I’ll be sure to post recipes and pictures when I do! Do you have a favorite bacon-themed meal or dish? Share a recipe with us and we’ll cook it up! MM Bacon! I know my Dad loves bacon but I’m not sure he’d like chocolate covered bacon. I would though, how can you resist anything smothered in warm, melted chocolate? Enjoy & Happy Fathers Day to all the Dads out there.